Jun 23, 10AM - first come first served. A few Solid State titles sprinkled in the list. Remember this is a charitable organization and cause. A truer comment could not be typed. Hello all, I attended this event today 6/23. This will be a brief report out on the event. As I understand it, this event served 2 purposes. 1 - fund raiser for the PPM by clearing duplicate game holdings, 2 - more publicity for PPM and for all the right reasons, and one could probably tie that to getting the word out that pinball is fun as well as educational. The PPM annex is out in Alameda, CA. On the old navy base. Easy access from 880. The event planners set up an entrance process, which would allow a continues trickle of participants. Overheard one family note this was similar to flying South West airlines, and they nailed it with that comment. I didn't count machines but I would guess that there were ~ 125 machines up for sale. 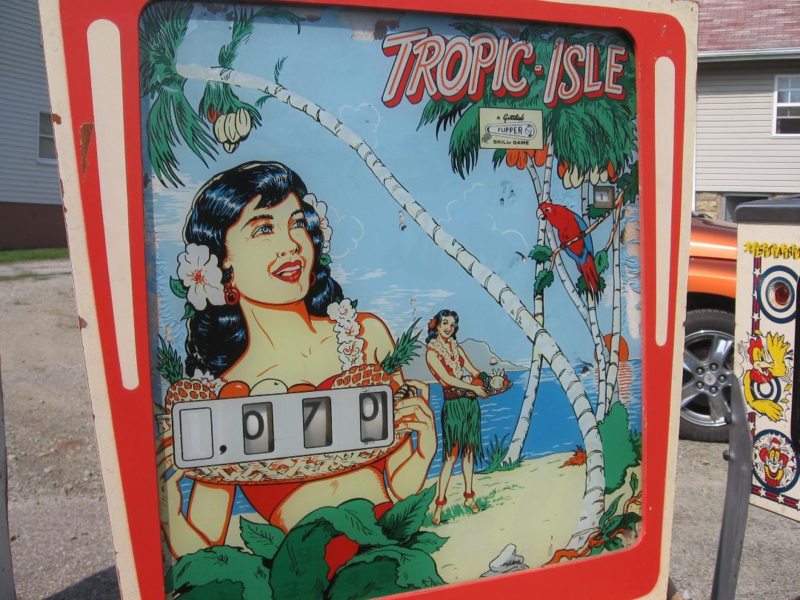 Machines which were functional were powered up and running and there was a note on the frame noting it was a working game. Some machines were presented with notes describing whatever issues may be taking place with the machine. The event did offer some replacement back glass, some art work and a few other odds and ends. The team that put this event together had volunteers at the ready to break down the machine and help with loading. There was an option to come back on a different day to pick up the machine as well. The team member that helped me with the purchase noted that this is the first time this event took place with PPM, and there is a possibility that there will be another event in the very near future. My opinion is that this was well organized, outstanding use of volunteers (lady that helped me out was from Sacramento, a 100 mile drive from this venue!). Checking out and payment was easy and as noted, getting the machine loaded up was equally painless. Almost 100% sure that Tropic Isle may be the one that I donated to PPM a few years ago. Got it from a collector in PA along with several others. Glad it is going to a good home. Nice game and one you don't see quite often. Is there a list somewhere to view of what sold? 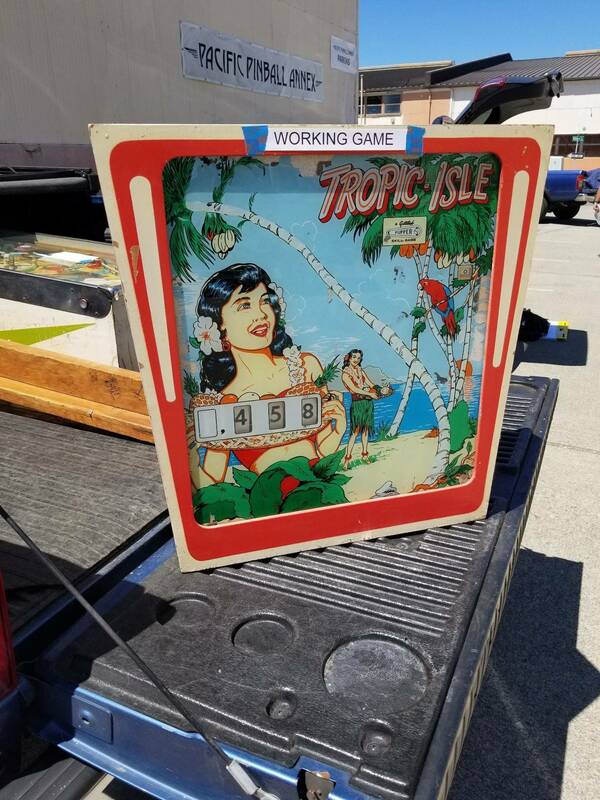 I now own a Tropical Isle machine, my first EM. Nice game and one you don't see quite often. Agreed. Love those two-tiered bullseye targets, too! So neat. Those marks on the head look awfully identical! I think that's a safe bet, Tom. Cool to see where it went! Would that be from the collection of the late Mark N.......? Tomorrow marks the anniversary of his passing. I believe it's four years now. He had some great games, and I believe his family is still selling off selected games from his collection. Those marks on the head look awfully identical! Also the missing paint on the BackGlass. that I still have in a closet in my basement. There was a question posted about obtaining a list of what was being sold at the event. Looks like they pulled the list down from the weblink. Will add that I have not gotten a follow up announcement on the second round of sales. Now wondering if they are rethinking this or if it just takes a lot of effort to put this together and the announcement is forthcoming.